My buddy Adam, of Orochon Ramen fame, makes his triumphant return to EatMeCalifornia in this first post in a series on Asian cuisine. As many of you know, I am not asian. I’m not even smart like asian people tend to be. I grew up eating meat and pototo based meals, and as a result, was morbidly obese at the age of 12. Okay, not really, but I was husky. Anyway, Adam is my new Asian food guru. He promised to show me the ropes and keep me out of trouble. 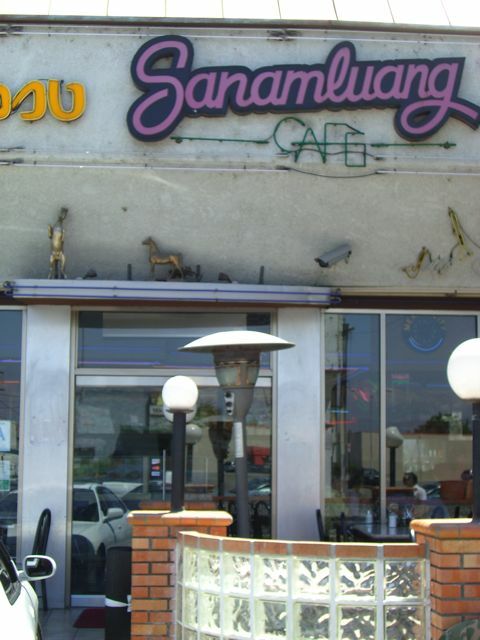 To get a good baseline for Thai food he took me to one of his favorite Thai restaurants called Sanam Luang Cafe. The real credit for this find goes to one of my former fraternity bros, Tam. His parents grow the fabled Ghost Pepper, which is the hottest chili in the world. Because of this, he knows everything about pretty much everything. So thanks, Tam, for lookin’ out. It looks different at night... i'm told. First off, sorry for the horrible picture. Adam is a photographer (his site is linked on the sidebar) and I’m sure he’s disgusted enough for all of you. My first impression of this place was that it was a converted 50s diner that serves Thai food. It was busy though, which is usually a good sign, so Adam and I snagged an outside table and caught some much needed rays (for me at least) before we ordered. While we waited, Adam gave me a little education on Thai food. Apparently the stuff come from Thailand. Who knew? I let Adam order our meal, which turned out to be wise considering the only thing I’ve ever heard of is Pad Thai and I don’t even know what that is really. We ended up splitting 3 dishes: a spicy beef salad, a mixed bbq and rice plate, and of course, the pad Thai. The thing I love about asian food places is that they are usually fast. When you order more than one dish they come at you in waves, which is awesome because you feel like you have an army of waitresses at your disposal. For how busy it was, I was really happy with the service. They were prompt and checked on us often, but were not overbearing about it. The spicy beef salad was probably my favorite dish, though they were all tasty. That’s actually why I don’t have photos on the food. We ate it before I had the chance. Anyway, the salad was your typical lettuce and tomato, with red and white onion, generous pieces of grilled skirt steak and an interesting lime/fishsauce dressing. I know what you’re thinking… What is fishsauce. I have no idea, but it’s a little salty in a nice savory way. It’s thin, so if you can tell yourself it’s red wine vinegar if it makes you feel better. The bottom line is that it’s good. Another thing I learned about Thai food is that lime and cilantro are key flavors in many of the dishes. That puts the flavor profile closer to Mexico than China, which makes it an appropriate first asian review for our site. The second dish is one that I can’t name, but in essence it was meat with rice. The meats were fried porkbellies, bbq pork and duck breast. The porkbelly was actually my favorite. It was crispy on the outside and tender inside. The bbq pork had that pink sauce that is common in asian bbq. It was a little too sweet for my taste, but maybe that’s just because it was sliced really thin and didn’t let the meat take center stage. The duck was tender, but there wasn’t too much skin on it, which is the most awesome part. Still, for about seven bucks a dish, I can’t really complain. The last dish, the pad Thai, came at the same time as the rice dish. I thought it was decent, but the noodles didn’t have the fried texture that Adam told me to look for. The sauce is a mild tamarind sauce which definitely benefited from a generous helping of Thai chili peppers that were sitting on the table. They also offered a kind of sriracha sauce, which was good, but didn’t offer the heat of the straight chili. I think this pad Thai is made for the L.A. natives and not for the folks from the home country. I’ve been told that many Thai dishes are Americanized and if you ask nicely they will do it up old school for ya. What’s special about Sanam Luang is not the quality of the food, which is decent. The big draw is the fact that the place is open ’til 4am. So when you’re coming back over the hill to the valley from a long night of bars and clubs, it is a great option. Price is also another great reason to go. Our entire meal came in under $30 with tip. For the amount of food we got, it was a great value. I think Sanam Luang is a great baseline for me to judge Thai food and I am happy that Adam recommended it. In turn, I’m recommending it to you. So if you’re drunk, in North Hollywood, and in the market for Thai food (we’ve all been there) take a left off the 170 north on Sherman way and check this place out. They even have valet parking for your designated driver.